This recipe is 9 Freestyle points per serving, 1 cup. Heat the olive oil in a cast iron skillet over medium heat. Add the onions and peppers and cook until the onions are translucent and the peppers are soft, about 8 minutes. Add in the hash browns and cook until the hash browns start to brown, about 10 - 12 minutes. Flip them half way through cooking. Add in the ham and cook about 4 minutes more. Add the cheese, and let it melt. Create 4 wells and add the eggs to each of the wells. Season with salt and pepper. 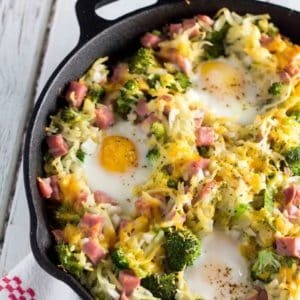 Transfer your hash brown skillet to the oven and bake until the eggs are set (about 10-15 minutes).